Okay… so I didn’t exactly say that because that’s not very professional BUT, I was excited to finally check something off my to-do list! Best part? I spent very little money on this redo as my cute next door neighbor took pity on my shabby mailbox and simply gave me a new one… um, about a year ago. Yes, my adorable next door neighbor dad GAVE me a brand new mailbox, which sat in my garage for a year. What’s wrong with me!? LOL! (Life of a blogger, much?) Well without further adieu, here is the new mailbox with its makeover complete. Do you dig it? I started with a new-but-dusty-and-slightly-knocked-around-from-sitting-in-the-garage-too-long black mailbox, as seen here. Okay wow, ALL my neighbors need a new mailbox. And new posts. Hmm, I think I’ll surprise my brother (across-the-street neighbor) with a new mailbox as well, sheesh! We’re all acreage homes so what do ya do? Anywho! 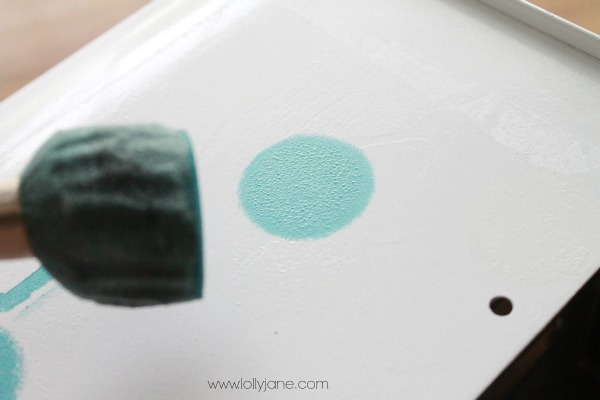 Give it a coat of your base color. 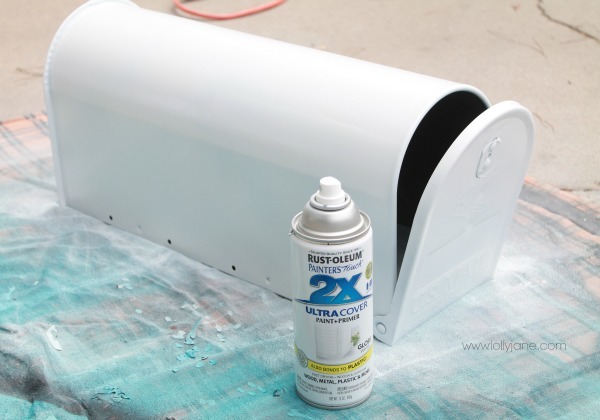 I chose Rustoleum’s 2x paint + primer… time saver! Just your standard white spray paint in a gloss finish. (and didn’t want to make another trip,) I simply shoved a bunch of washers behind the screw (inside the mailbox) to make up for the space. Problem solved! LOL Then I screwed it in, nice & tight. Gosh, don’t you already just love the custom look? Only $5 and gives it a huge statement! Okay so now to spruce up the flag…. because it holds the stencil very tightly but won’t peel off the fresh paint. I only allowed the paint to dry for a couple of hours in between errands and this tape didn’t rip off a speck! This step is slightly confusing but worth it. So, I wanted the octagons to be hollow so I used ScotchBlue Painters Tape to mimic the octagon. I made a sample octagon by cutting and laying a few different pieces of tape until I got the shape I wanted. Then I laid my sample back-to-back on a new piece of tape so they wouldn’t stick (pic 2) and cut around the new shape. Then I placed it inside each octagon and painted around it. That’s it! Using a circle foam sponge brush from my local craft store, I sponged on a few circles in random places. To create an arrow, I placed 2 pieces of tape where I liked it, made an arrow head and small tail and painted inside. So easy and no leaks! This is where owning a vinyl machine comes in handy. I used mine to create an “M” for my last name and house number, (Bell MT font.) I then painted the insides gray to match the custom pull and just lovely love love how it all came together. to make it stinkin’ cute so stay tuned! 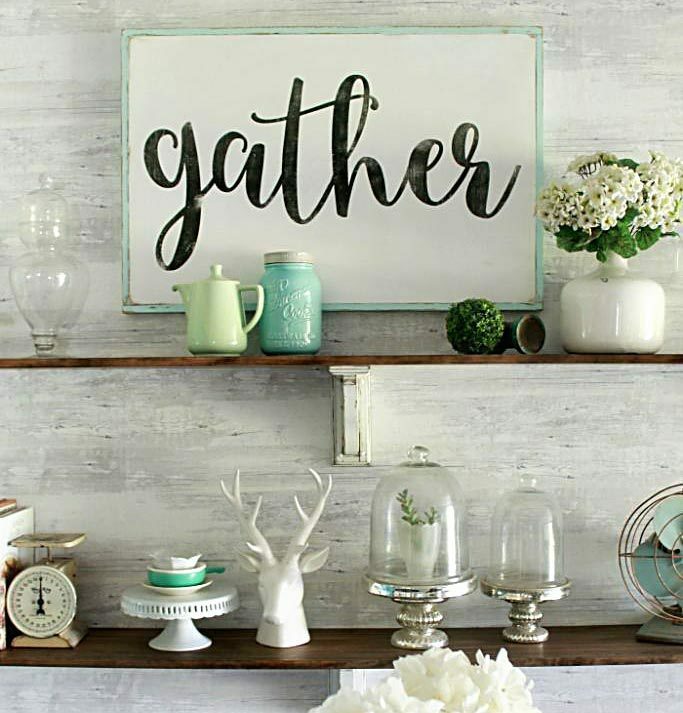 Oh, and if you loved this project, you’ll want to be sure to check out all the other creative talent at the Summer DIY Blog Hop taking place at Centsational Girl’s blog! This project was brought to you in partnership with The Home Depot and ScotchBlue Painter’s Tape. Follow along! Ummm hellloooo. I want this mailbox. It has an M (for Mique…who cares about P for my last name), honeycomb and is DARLING. Only I’m in CA, the land of a million mailboxes in one. No stand alones here. Wah wah wah. Also- no acreage here either!! I’m jealous about everything in this post. I have to do this now! My mailbox is already white. Do you think I will need to rough it up a bit to get new paint to stick? I am really in need of a screen door to let in all those summer morning breezes!! Kelli- you’re too stinking cute. I am freaking out over the design! 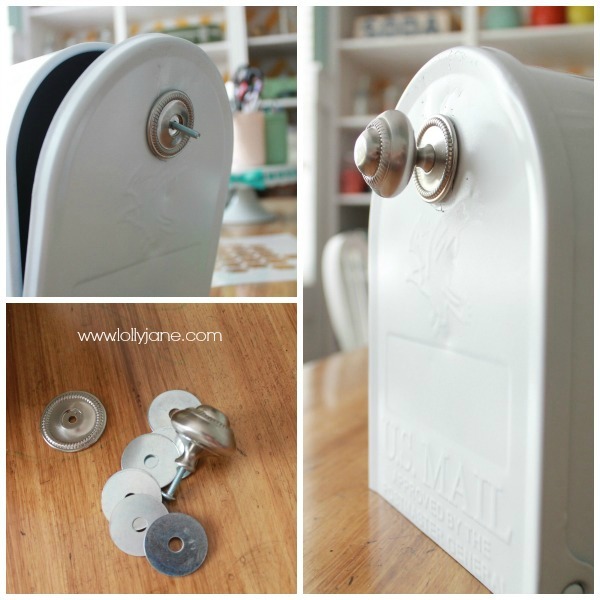 I absolutely love it- and now I want to go get a mailbox just to make this! We have a big funky community box- don’t think the USPS would like me jazzing it up, sadly! 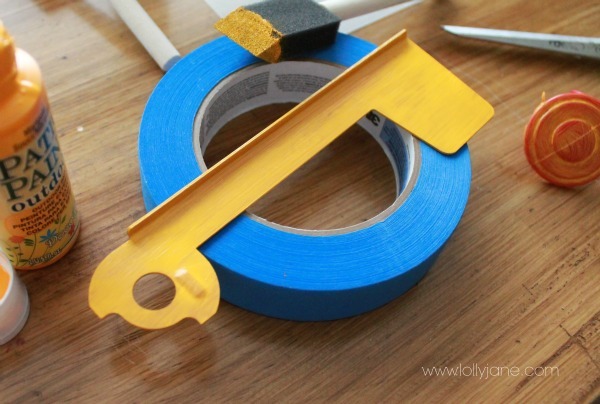 I could definitely use some painters tape for my front door which is in the process of getting a paint job! I’ve been trying to talk the hubs into helping me do some board and batten in my family room. So far, he’s not going for it. 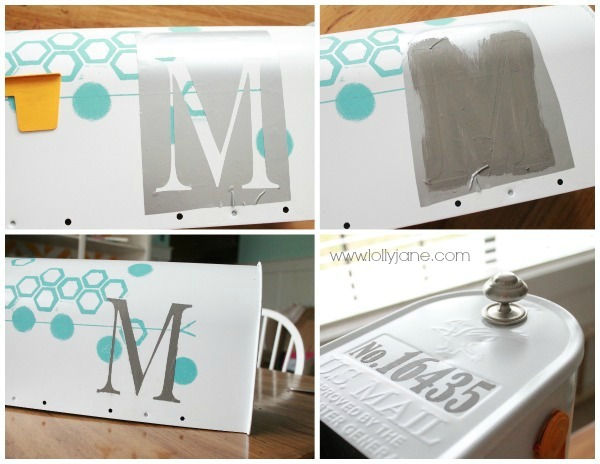 I would use the gift card to update my own mailbox or another one of my projects on my DIY list. Awesome job! I would make over my daughters playtableby using SctochBlue Painters tape and Behr paints from Home Depot. Using them to make a boring one color tabletop into a game top that can be used for matching games, checkers and other fun activities. I have a nightstand that is in desperate need of a spruce up! how cute, and this is a great thing to personalize! 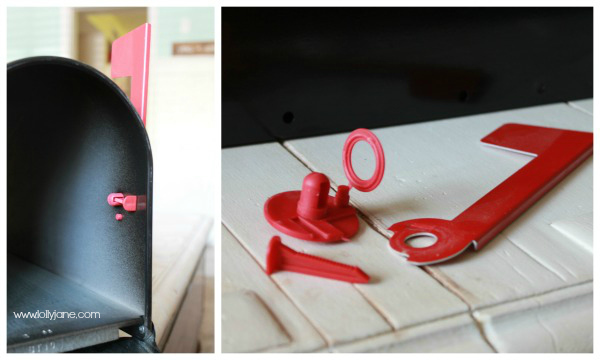 I’m totally inspired… your mailbox is adorable! I’ve been toying with the idea of transforming my mailbox and haven’t been able to find an inspiration point. Thanks for motivating to get started! Awesome project!!! I’d love to do a mailbox make over, but I’d probably use the gift card to buy wood and numbers to create a house marker. I want to re-do the trim on my windows so I could definitely use some scotch painters tape and a little $$ to Home Depot! I need PAINT. PAINT, PAINT, PAINT! Doing two kid room makeovers right now. So, obviously, I will need paint TAPE as well. Super cute mailbox!! 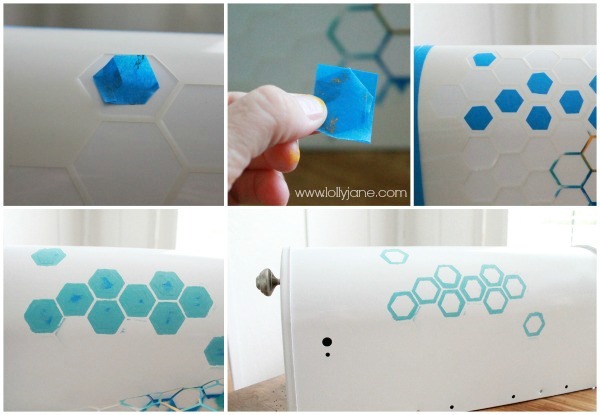 I would like to try something similar to your mailbox makeover with the Scotch blue painter’s tape. What wouldn’t I do or buy? If I won the gift card I would buy the Dremel Moto Saw. I have so many uses for that thing but can’t bring myself to spend the money on one. I love this! I have to make it now! I am in need of some wood! My husband is dying to make us a new tv table! Also, according to USPS.com guidelines…. any shade of green, brown, white, yellow or blue. The preferred flag color is fluorescent orange. What a cute mailbox! We are getting ready to I’ve into our new home and quite a few things need makeovers. The mailbox is on the top of my list. Seems easy enough. The kids rooms are looming large. I wanted to say that your mailbox is stunning! How fun!!! Now I MUST do two things, 1) convince hubby to update our mailbox and 2) figure out the design. Great job and very inspiring. To enter the giveaway, I have this pinned and plan to complete in a few weeks for our front porch. Its older but its stunning. Makes me wish we had stand-alone mailboxes in our neighborhood! Someday… 🙂 Love the makeover! Vintage Beach signs!! 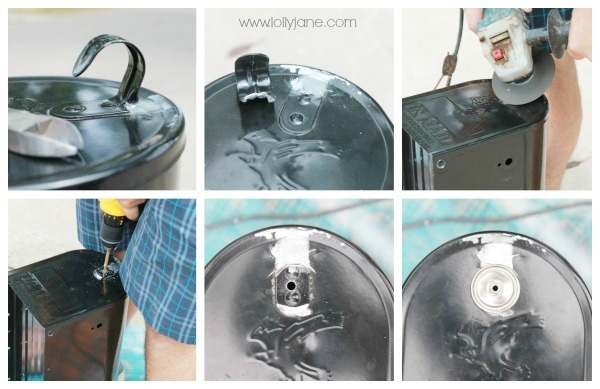 Great summer DIY AND paint project in one! I adore the way this room make over came out! And I really appreciate how much work that went into it!! Just beautiful! 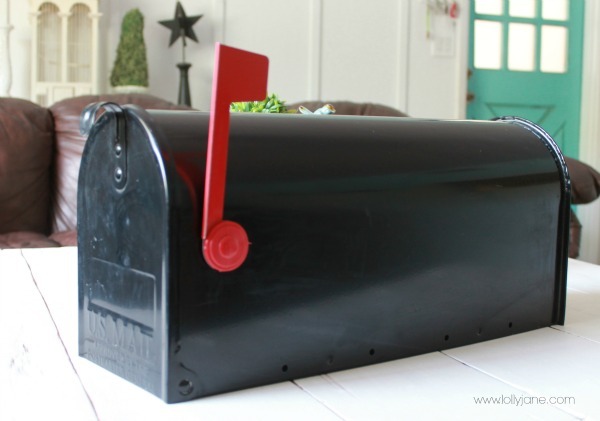 Because I wish I had a mailbox to decorate like this…. how cool! i think this one is a new favorite- what postman or woman would not like this makeover- I bet many people never give a second thought to how their box looks! this is really cute! Cuuuuute mailbox!! Too bad our mailbox is a community/ neighborhood one! Shanty 2 Chic posted this awesome address and planter post http://www.shanty-2-chic.com/2013/07/address-numbers-post-planter.html ! Super cute too… Think it would look great in our garden in the front yard!! 🙂 P.s. Love your blog!! I love this idea for making quick, inexpensive outdoor pillows! Oh how stinkin’ cute!!! I may just have to try this soon, myself!!! I have spent the majority of the summer thus far revamping the mismatched furniture in my boys’ room, so not really a “summer” project. However, I ran across the cutest plant hanger today and will be headed to Home Depot tomorrow for the supplies!!! I have Shanty 2 Chic to thank for the inspiration on that one: http://www.shanty-2-chic.com/2013/07/address-numbers-post-planter.html!!! Love, love, love this!! It is so stinkin cute!! I want to do this to my mailbox. Love it!! We’ll be painting our front door & shutters when we get moved into our new home at the end of summer! So darn cute! I love these painted rosettes! 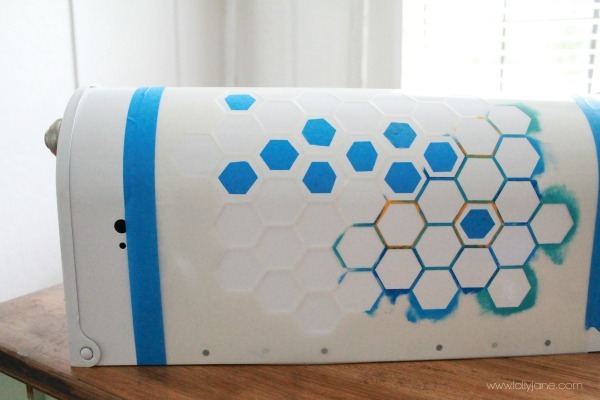 I’d love to stencil more! SUPER cute!! Thanks for the chance! I want to do this this summer to our outside BBQ area. We have a built in BBQ and I think this would class it up! I mean, seriously, how creative is that!?! Anything Mandi does is amazing! My favorite summer project so far has been my front porch swing. It’s been much more challenging than I thought it would be, but fun! What an adorable mailbox. I think I’d like to do something much the same. My current mailbox is the old, ugly plastic kind on a rickety metal post. Looking forward to doing this chalkboard backsplash in my home! I would love to paint my bathroom! We bought red furniture from ikea, two dressers for a nursery, now we are trying to match the paint. I picked up a great changing table at a yard sale, but the color is wrong. And also a mirror and end table…want to match the red furniture. Will be taping off and using a lot of blue painters tape. What a fabulous job! Love the hexagons. 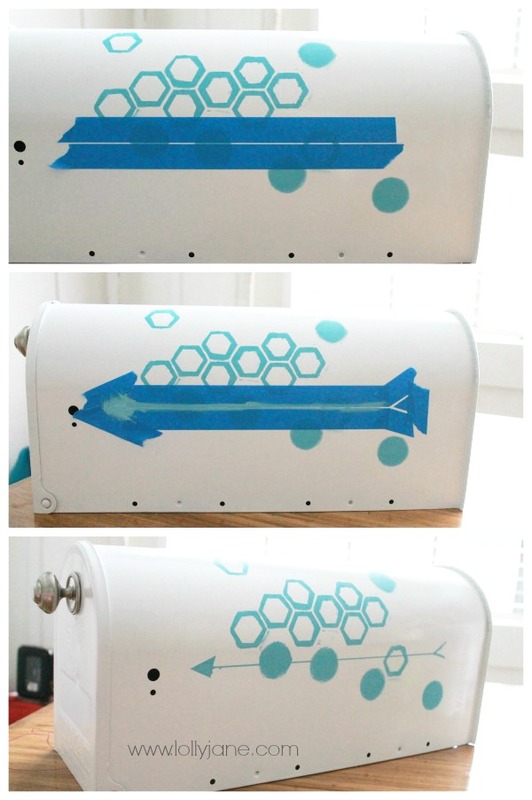 Too bad I don’t have an individual mail box to makeover…would have loved to have given a try. 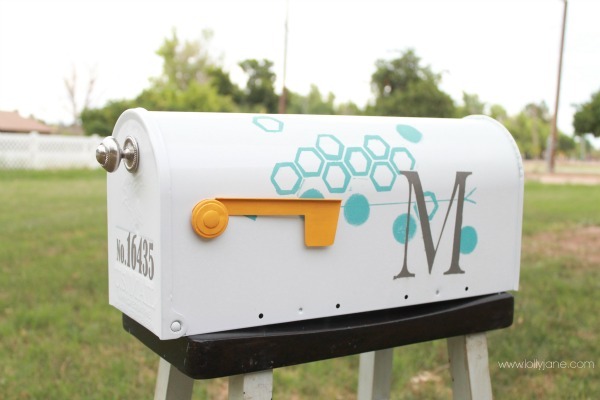 What an awesome looking mailbox! I LOOOOOOVE this too! The colors and the shapes are just awesome! I’m in love! Well, my summer DIY project is to repaint all our door jams in the house. I also need to repaint the hall bathroom cabinet and may add some trim and knobs to give it new life. Love the mailbox. Have one attached to my house and that pattern would be great. Super cute mailbox. I would love to make paint an frame for my instagram prints. I love Ana White and her amazing plans. I love this DIY Frame & panel planter. Sticking with a mailbox theme,I’m wanting to try this for my garden, but now I’m inspired to make it a super cute mailbox! Love the way yours turned out. I’ve been waiting 6 months for my husband to start planking our bedroom walls. This will be a great start towards it! I am wanting to do this pallet sofa but maybe a little smaller, I have a small space to work with. I love your mailbox, I really need to redo mine too. Super cute mailbox. I have never seen one like it! Nice job. Love this mailbox! Sharing on fb today! Okay…. so…. I admit that we just bought our house a year ago, but our mailbox looks worse than your original one. I am SO inspired to either give it a makeover or to buy a new one and make it this cute!!! Thank you SO much for sharing!!! Honestly, this has been my favorite project that I have found this summer so I would link back to you! I like the checkerboard table! (http://www.dreamgreendiy.com/2013/06/24/bloggers-hop-game-table-featuring-scotchblue/) If I try it, I think I’ll have to make something to hold the pieces when not in use, or they’ll be everywhere. 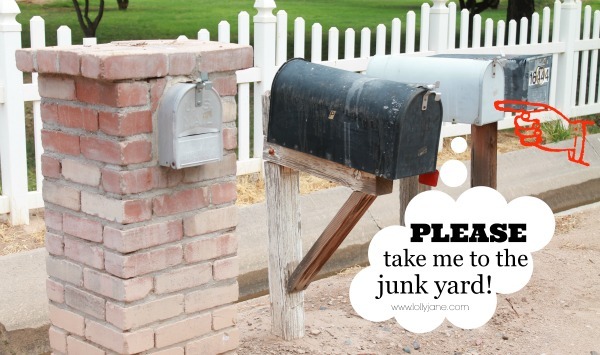 What did you use for a post for the mailbox? This is really cool! Who knew mailboxes could be beautiful?